Summer appears to have arrived, both Saturday 1st and Sunday 2nd June were warm and, for the most part, sunny. Saturday found me at Old Linslade for the afternoon and Sunday not far from home in North London for a DBS Ipswich to Doncaster intermodal and the Scunthorpe to Dollands Moor steel train. The weather continued in the same vein for most of the following week, breaking down a little on Friday when it started to rain, just as I went out for the Paddington to Northfleet spoil train. The following week was much more varied, I took a few pictures on my way too and from work as usual. Saturday was spent on my bike paralleling the Overground's Outer Circle until the rains started and then the bike and I travelled home on the Outer Circle. Week commencing Sunday 16th turned out to be warm and sunny for much of the time, with the occasional summer shower. The weather didn't hold into the weekend unfortunately, although I was pretty lucky on Saturday 22nd when I visited the Welshpool and Llanfair Light Railway on one of the weekends the vintage train was in service. The last week of the month was average for this summer, with the exception of Friday when it rained, and I had the day off work! Admittedly it wasn't specifically for train chasing purposes but as I had a few hours free in the morning I did venture out for some wet weather pictures. July has been a revelation so far, for the first few days it was so so and then, from Friday 5th onwards the sun has shone, almost continuously from morning 'til night. I've tried to take as much advantage as possible whilst cycling too and from work. The fine weather continued, more or less continuously, eventually breaking overnight on the 22nd/23rd. Even so it remains warm and muggy. The final weekend of July was more mixed, Sunday saw me down on the Welsh border around Chepstow. August was ushered in with more hot weather but of a more Engliah nature, accompanied by sunshine and showers! My ride home from work on Friday 2nd was quite productive as was Saturday morning at Old Linslade and back in North London. On Sunday 4th we set off for a few days in the Welsh Marches, I managed a couple of picture taking sessions which included the ATW 67 hauled Holyhead to Cardiff and the Baglan Bay to Chirk log train. From Shropshire we headed east to Norfolk for the second half of the week and an afternoon out in the fens. Back to work the following week and the darker evenings are becoming very apparent. It wasn't that long ago I was taking pictures at 20:30, not now I'm afraid. Managed a few pictures during the week, the re-timed 4L38, Chiltern's 17:50 and 18:15 ex-Marylebone and a couple of extras at Lewisham plus Sunday's Scunthorpe to Ebange steel at Hadley Wood. Much the same the following week, the shorter days becoming more noticeable before a bank holiday weekend in Norfolk. This summer gallery ended as it began, at Old Linslade on August 31st, a lovely late summer day. During the previous week I had taken a few more pictures of Chiltern's afternoon loco hauled services and the early evening freights on the Goblin. 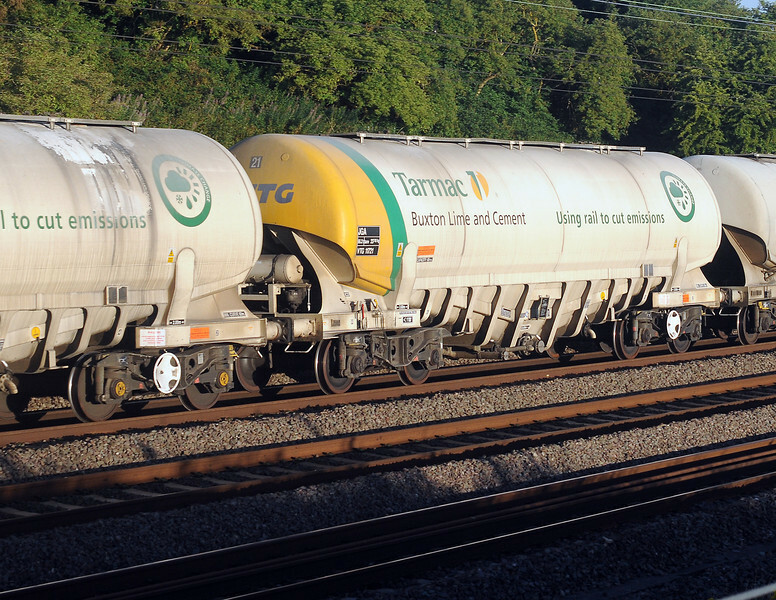 The Tarmac cement hoppers are impressive wagons.